If you’re about to paint your walls, you know how hard it can be to find the perfect color. And it’s even harder should you be trying to match a particular shade. “Good enough” is not always good enough when you want the finished paint job to look just right, especially if you plan to hire a professional painter. Whether you plan to touch up a small area or give an entire wall – or room -- a facelift, find out how to match paint. Start with a clean slate. If you’d like to know how to match paint which you applied some time ago, start by making sure that it's not discolored by dust or dirt. Give the painted area a good cleaning. Scrub gently with warm soapy water to remove any grime that’s built up on the surface. Then allow to dry thoroughly before you attempt to match the color. Go hi-tech. Looking at color charts online will give you an idea of possible color matches. However, your device may not show 100 percent true color. If you are matching existing paint and you remember the brand you used, the manufacturer’s app (such as Benjamin Moore’s Color Capture) will analyze the color for you. Just take a photo of your painted surface, then upload it to the app. Go low-tech. Double-check your digital findings in a brick-and-mortar store when it’s essential to get a perfect match. Or skip the digital search altogether and just bring in a sample; remove a 1” square of painted drywall from an inconspicuous place. If you’re trying to match color on another type of material, such as upholstery fabric, bring in a sample of that. Any home improvement center worth its salt should have color-matching technology. Don’t forget about finish. Obviously, getting the color exactly right is essential, but do keep in mind that there is another aspect to how to match paint. The finish (AKA “sheen”) -- flat, eggshell, satin, semi-gloss, or gloss -- must be carefully coordinated, as well. This is especially crucial when you plan to do just a small touch-up. Sample the true color. When you need to be an absolute perfectionist about this project, buy a small can of your chosen hue and paint a sample on a scrap of board or sheetrock. Once it has dried, you’ll get an accurate version of the color; just hold the sample up next to the paint which you’d like to match, for comparison purposes. Buy the right amount. Because different batches tend to vary in color, purchase all the paint you’ll need for this particular job (and maybe a little extra you can store for future touch-ups) at one time. PAINT BUYING FORMULA: Calculate approximately 1 gallon of paint per 350 square feet of wall or ceiling, more if you’re covering previously unpainted drywall or applying more than one coat. Keep a record. 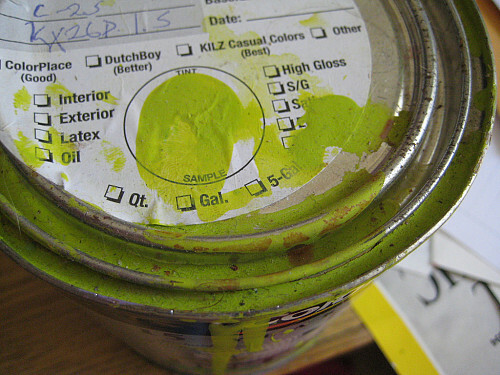 Record the manufacturer, formula name, and number whenever you use paint in your home. Paint a small swatch on a sheet of cardboard so you’ll have a “real-life” sample of the color, as well. This means that if you don’t end up with any leftover paint, you’ll be able to go out and purchase as close a match as possible. Touch up a small area … the right way. Should you just want to cover up a ding in the existing paint, first clean the spot. If you’re using paint saved from the original application, dilute it slightly (about 10-15 percent thinner should do the trick) and mix well. Apply with the same type of tool – roller or brush – that you utilized originally, using a feathering motion to blend the edges.